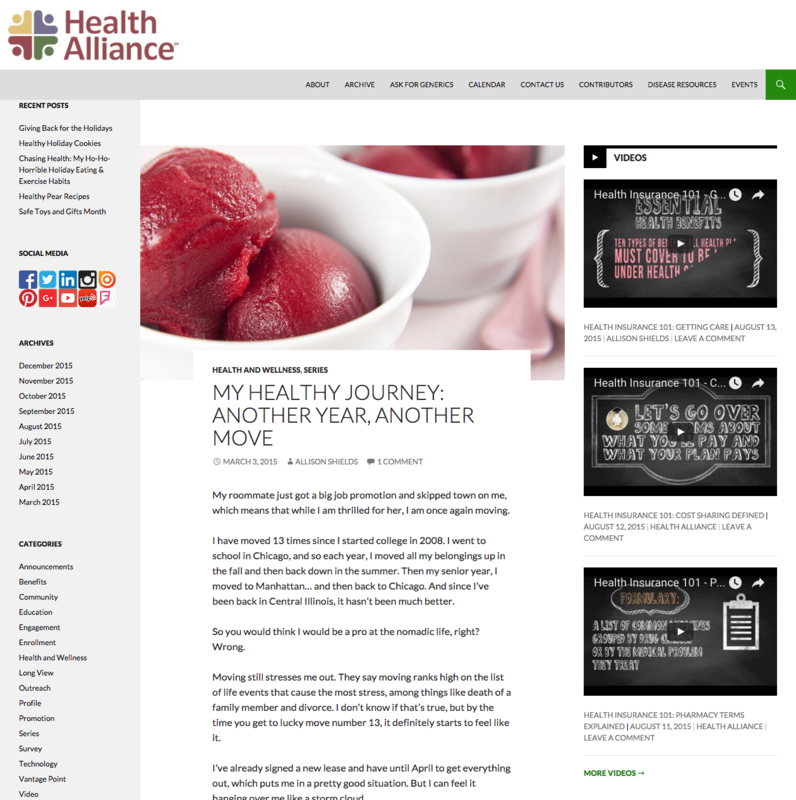 When I arrived at Health Alliance, their blog was outdated and neglected. I updated it with a more modern theme and design, organized the content into clear pages, categories, and tags, and went through to rewrite every single post to make the content informative and bring it up to our web style and brand standards. 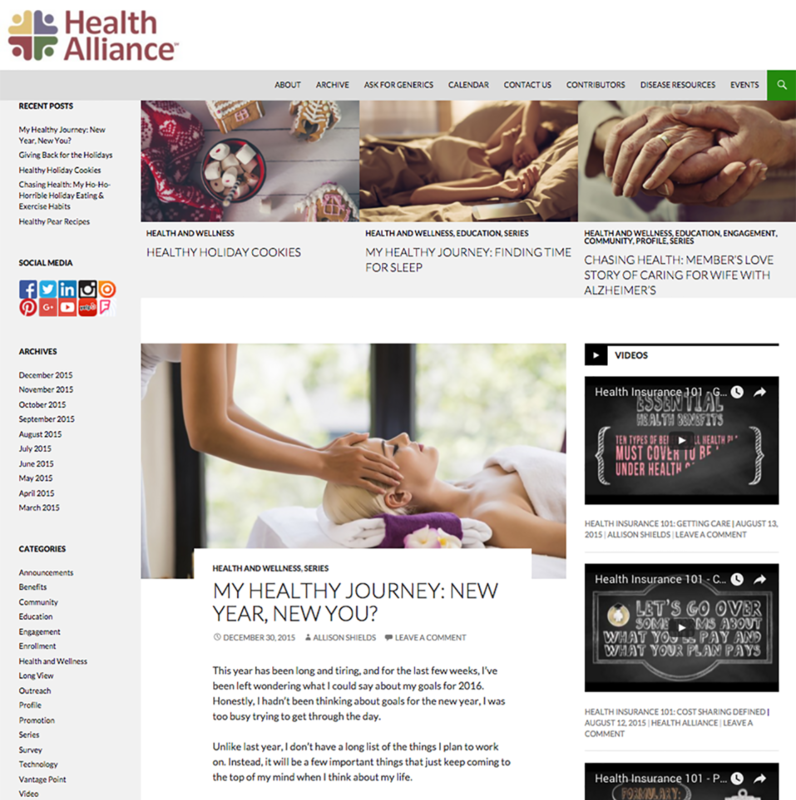 I also integrated another blog the company had called Ask for Generics, added disease resources pages, and launched and continued to add to a health and wellness section with education on a variety of helpful topics, from talking to your doctor and what to expect at your physical to reading nutrition labels. I also went through and updated the SEO for the entire site and for every post, which boosted its rankings, especially on certain health subjects, but also contributed to the overall SEO improvements we’d been able to make with our sites across the board. These changes increased our views by over 4,330%, and our number of daily average visitors rose 400%. 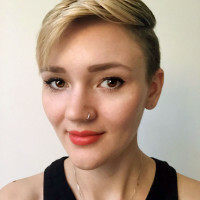 And it increased the blog’s community, taking it from 0 comments to over 180, and transformed it into a place where people could truly interact with health and wellness info. For the home page, it was especially important to me to have a theme that allowed me to feature content, like the videos and important posts, and added clear organization through categories, archives, and tags. One of the biggest things I wanted to bring into this blog was an actual blog series with a human voice. My Healthy Journey is a series of posts about my own struggles to be healthy. From moving, to eating right, to bingeing on TV shows, to dealing with stress, I cover it all through my own experiences. I also connect people to helpful resources and our wellness tool to help others on their own healthy journeys. And most importantly, I get to put a personal, humorous, and playful touch on our digital brand. I've also been able to use this series to drive our Instagram content. After I'd started my own personal series, one of our other copywriters volunteered to write her own series called Chasing Health. 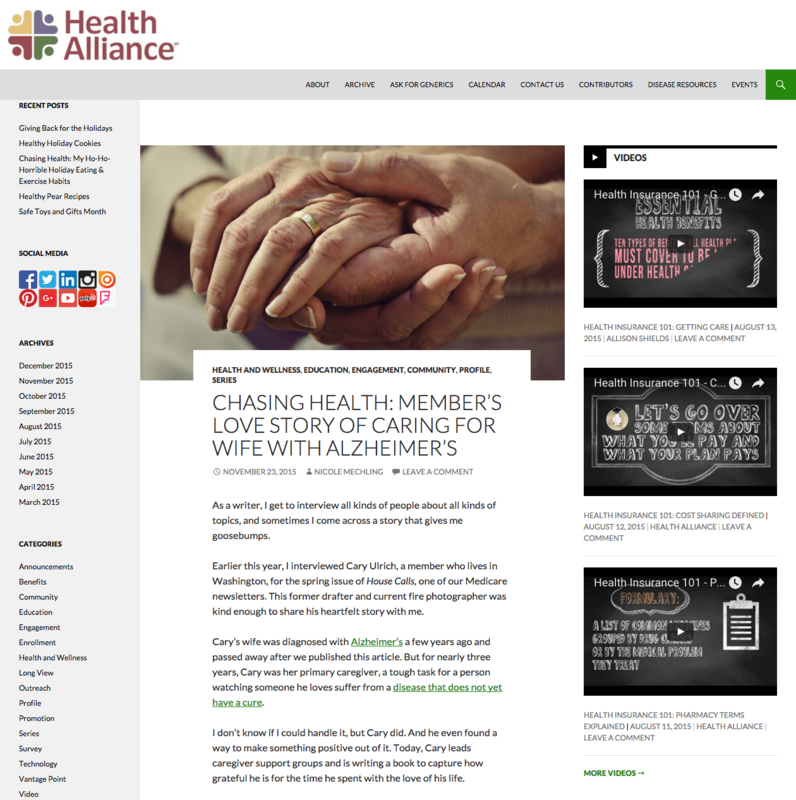 She also transforms many of the member interviews she does for newsletters into touching posts, such as this one about a man who cared for his wife through her Alzheimer's. 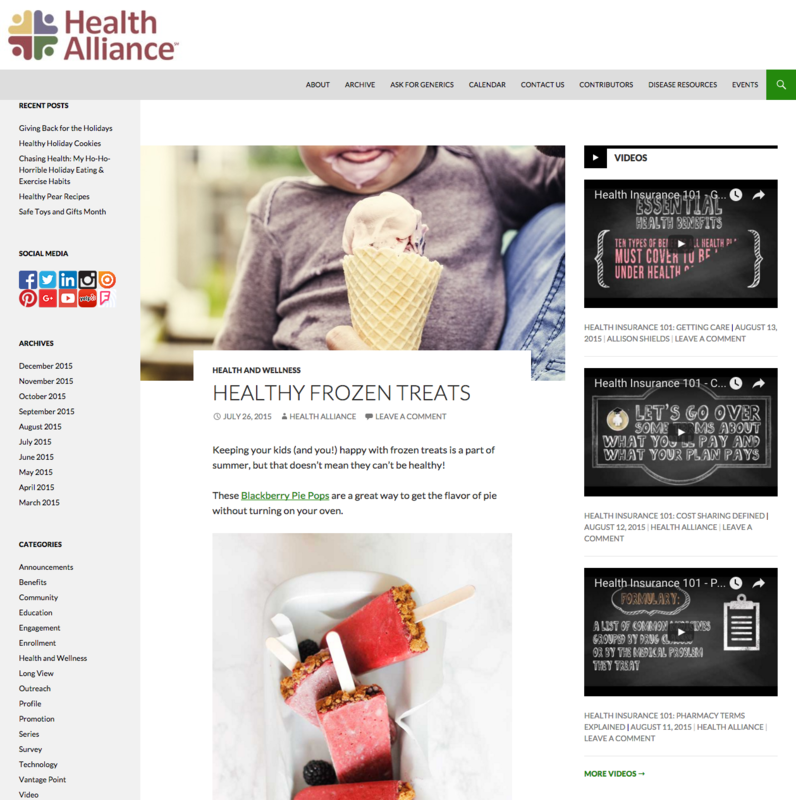 We use the blog as an educational platform for all kinds of subjects that are important to health, but don't necessarily belong on the websites to sell and use our plans. 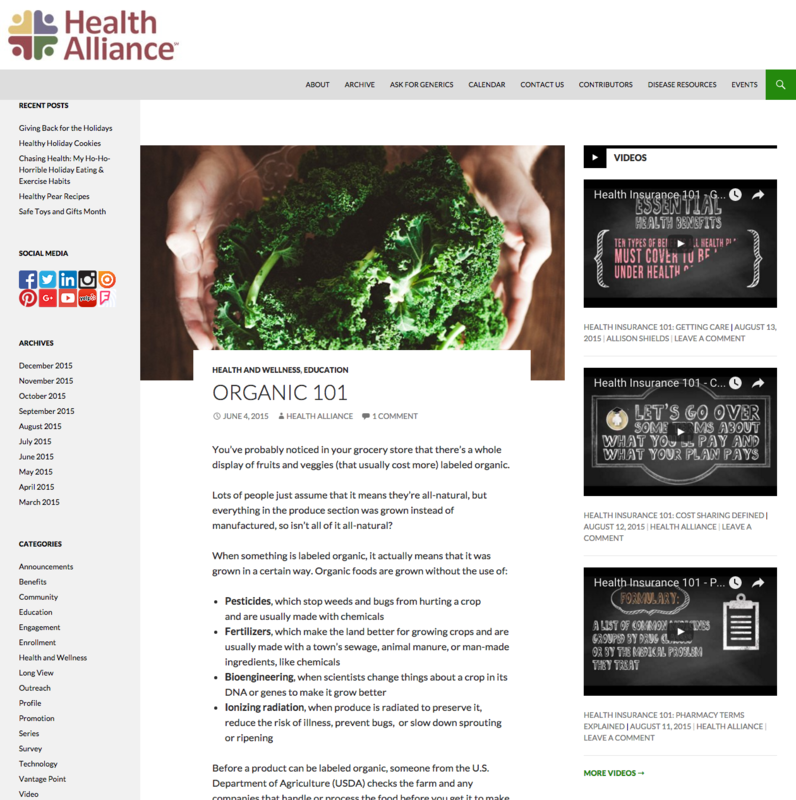 This particular post outlines what organic really means and which fruits and vegetables it might be beneficial to buy organic. When we expanded our Medicaid audience, we saw a rise in the need for health education on all kinds of subjects. Even though we've left that market, the popularity of this education drove me to continue building a network of posts on health. 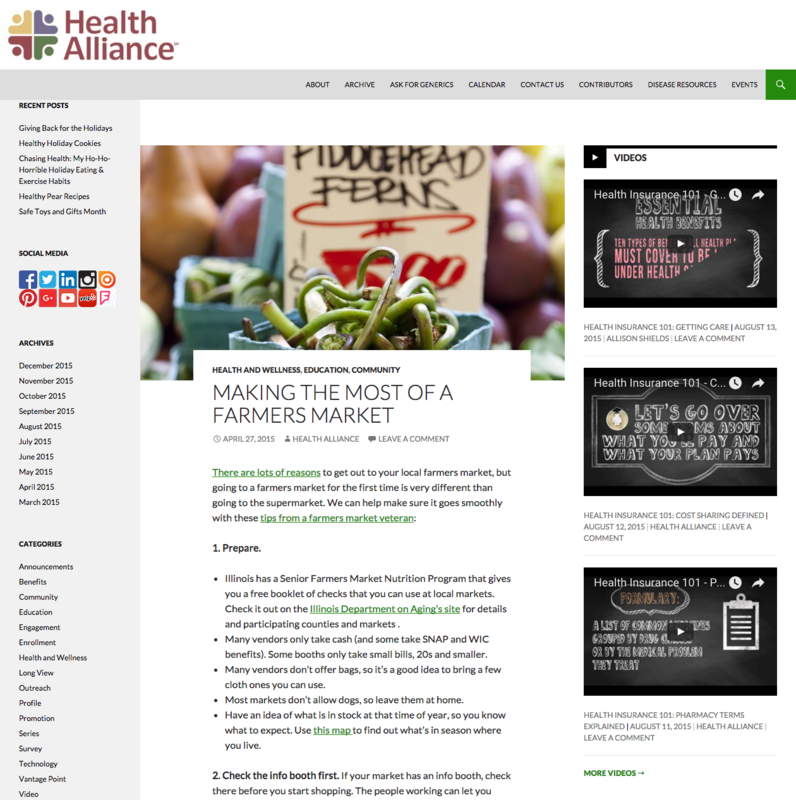 This post outlines the value of farmers markets, especially for those with low incomes. 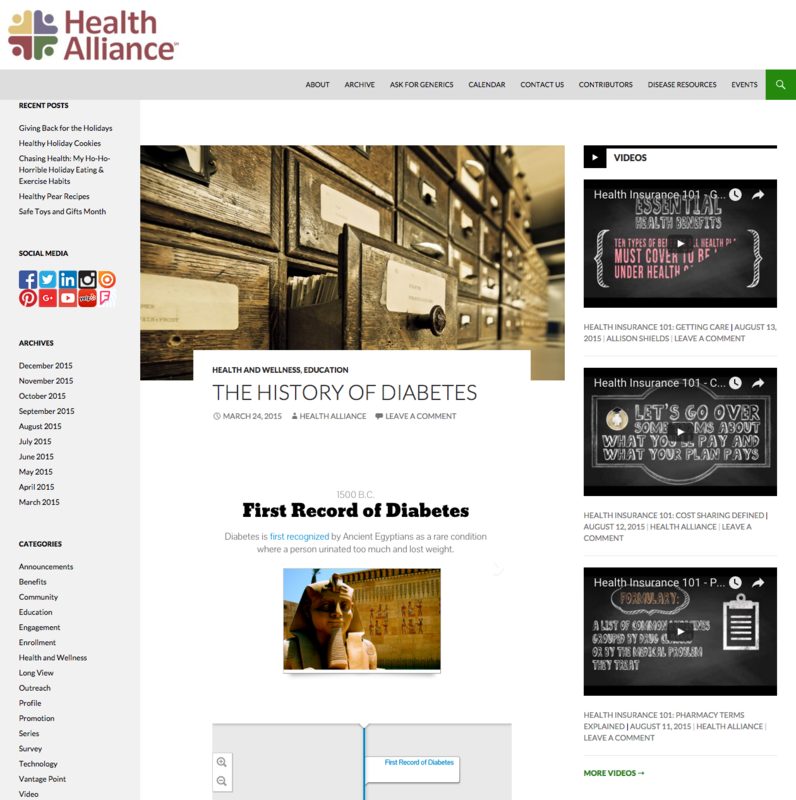 Other posts address issues in the public eye and health news. Antibiotic resistance is a growing problem for the industry, and this post helps people understand the difference between their flu, cold, and bacterial infection symptoms, so they can help their doctor get the right diagnosis, and prescription, for their illness. 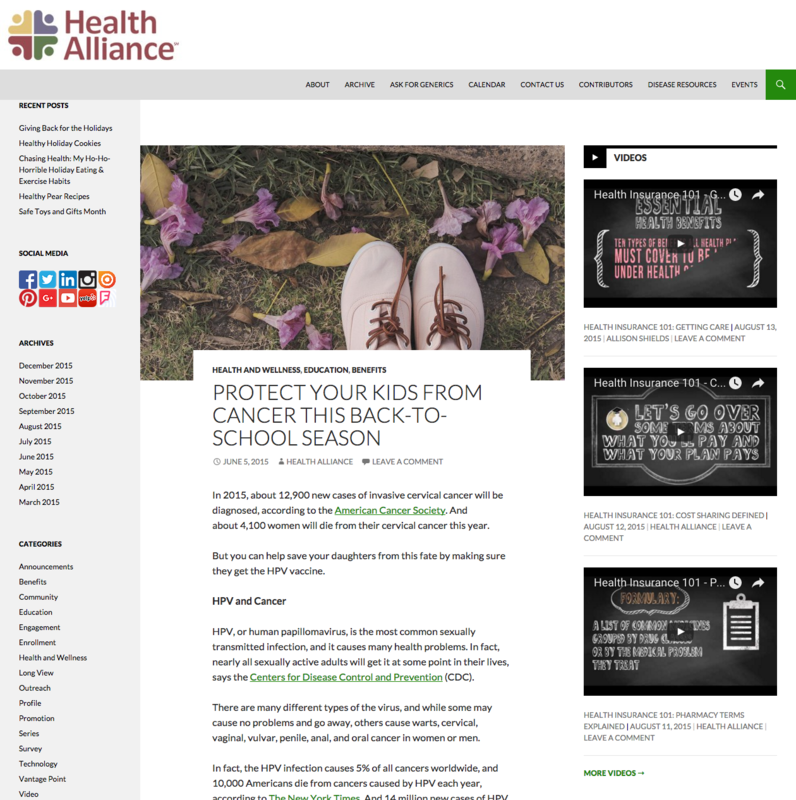 Some posts' subjects are brought to us by other departments who want to help highlight important preventive coverage our members should take advantage of, like this one about the HPV vaccine. Other posts feature detailed info about health insurance subjects. 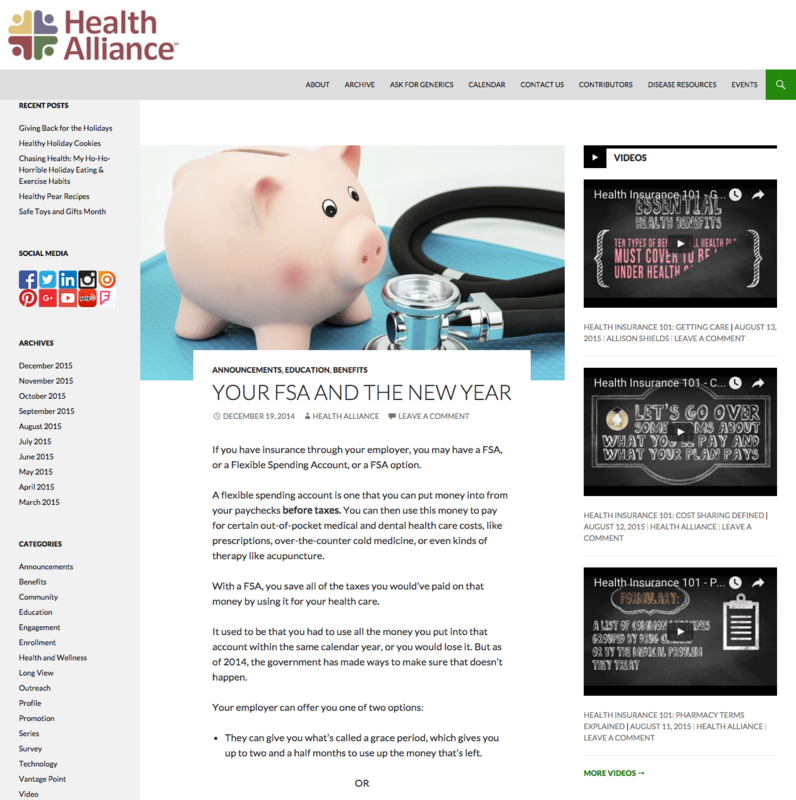 This one breaks down FSAs to help people make use of leftover funds before the new year. I also regularly build infographics specifically for the blog, and this features one of those. 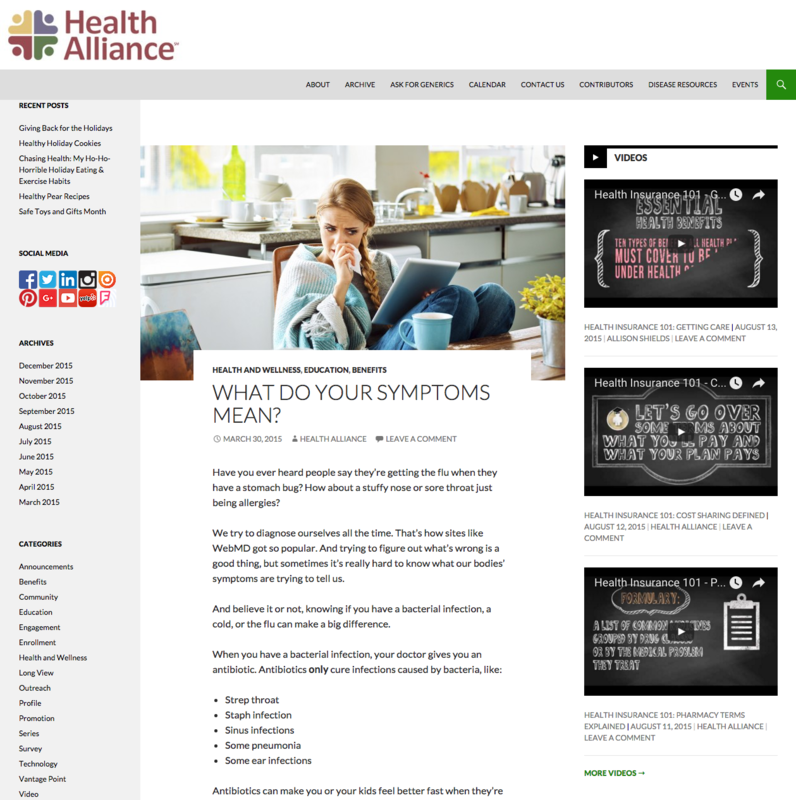 Health Alliance has a disease management program, so I built a series of articles and resources on the main diseases we help members with. 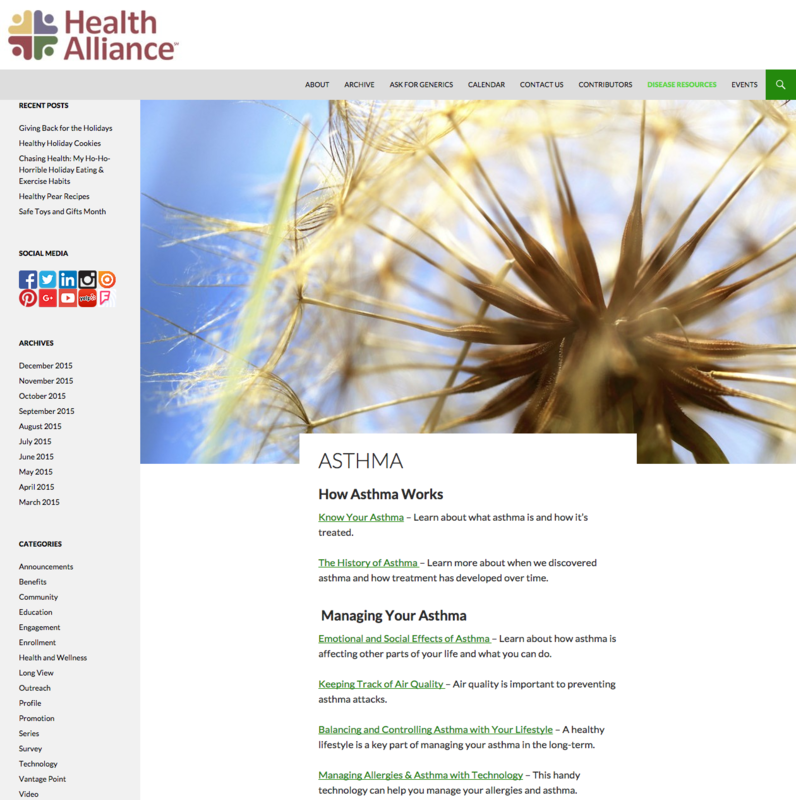 This is the asthma page, which compiles all of our blog articles on the subject into one easy to scan resource. 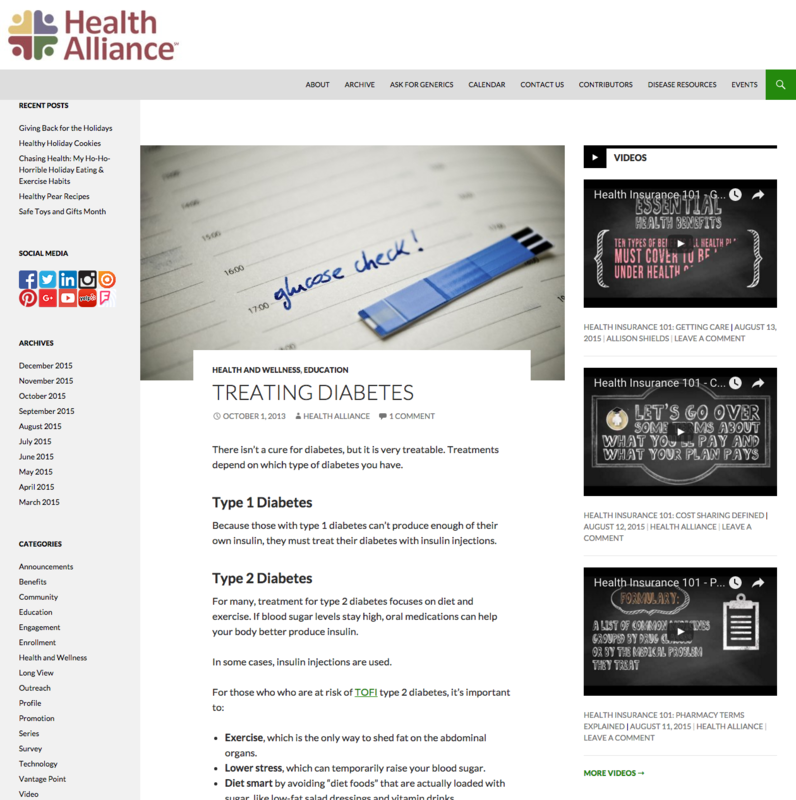 This is an example of one of the diabetes-specific posts, which outlines the treatment of diabetes. The team that runs our disease management program was also interested in sharing the history of these diseases, but I struggled to find a reliable and interesting resource, so instead, I compiled these interactive slideshows. I also compile my weekly social media subjects on food and health subjects into weekly blog posts. This both guarantees that I'm always adding new content to the blog, and that people who want to view all of the posts, or simply want to return to a resource, can easily find them.